ITiC works with organisations to implement the effective use of mobile scan technologies like QR codes, NFC Tags and Augmented Reality, that help users by offering links to interesting online and text information. Together with mobile apps and GPS mapping, mobile interpretation can help people get the most out of their heritage property or site visit. The cost of introducing mobile interpretation is also relatively low and any negative visual impact is minimised, for example by using existing waypost markers. What sort of information can QR codes, NFC Tags or Augmented Reality link to? QR codes and NFC Tags can link to website pages, mobile apps, text, pictures, audio, video, games, or any web link. Augmented Reality uses a mobile's camera or GPS to offer the ability to scan a location or picture and provide a 'virtual view' of points of interest or facilities all around a location. 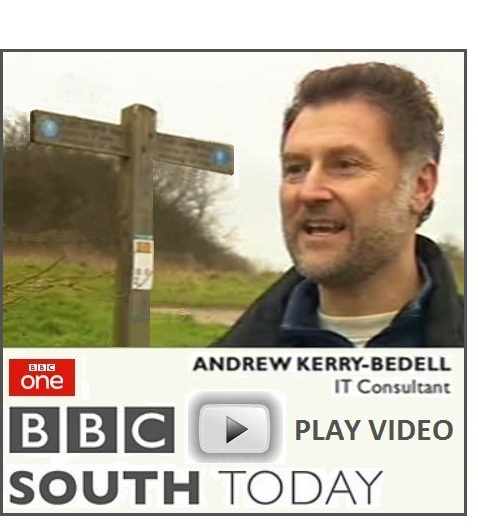 BBC South Today on the South Downs - BBC interview on new mobile interpretation featuring QR codes, NFC Tags and AR. Hampshire CC - ITiC QR, NFC, AR and mobile app proposal for a cross-county heritage trail. AHI conference - ITiC presents QR code research results from the South Downs trial. North & South Downs National Parks - ITiC responds to mobile project requirements. Interpretation partnership - ITiC teams up with Fitzpatrick Woolmer for mobile signage. Cornwall UNESCO sites - ITiC team briefing about QR codes, NFC Tags and AR for mobiles. NFC Technology Partnership - ITiC agrees partnership with RapidNFC to share research. We would like mobile users to tell us about their experience of using mobile interpretation. Please take part in our mobile questionnaire which should take no more than 5 minutes!